TIME Alpe d'Huez 01 review - LA VELOCITA. I love high-end French brands because they so often tend to be bonkers. They exist in the haze between genius and madness; pushed by engineering creativity, skilled aerodynamicists, and carbon composites talent. They’re the Rick Sanchez of the global bike industry but with, I imagine, less belching and nihilism. So naturally I was very interested to test a TIME Alpe d’Huez 01 when asked by Australian distributor Bikesportz. The Alpe d’Huez is a premium frame with a hefty $6999 price tag. Then again, I’m always interested to test new bikes. Bikes are awesome. So, how awesome is the Alpe d’Huez? Let’s find out! Build provided from Bikesportz: Campagnolo Record 12, Reynolds AR 41 X wheels, BBB bar and stem. TIME places the Alpe d’Huez into the “Altitude” segment of their range and spruik it as their lightest ever frame. So you’re probably salivating at the prospect of a featherlight hill killer named after an iconic mountain, right? Well, TIME claim 840g for a small frame. That’s not remarkably light, especially at this price. TIME mean something different by “Altitude”. This frame is made for long days in the high mountain. For going up, plummeting down, and the valley roads in between. It’s posited as an all-round conqueror of Alps. While it might not drop jaws with weight, there’s some very sophisticated composites manufacturing processes going into the Alpe d’Huez. TIME uses carbon braiding; a process that allows for complex orientations and arrangements of carbon wires. Different parts of the frame can have specific braids depending on what stiffness, compliance, or weight they want in that part of the bike. Each TIME frame has 73 different braided sections in it. Resin Transfer Moulding is then used; a process that sees braided carbon wrapped around a solid core. Resin is then injected under pressure into the molds and creates a smooth surface over the braided carbon. TIME claims this system creates a void-free carbon tubes. 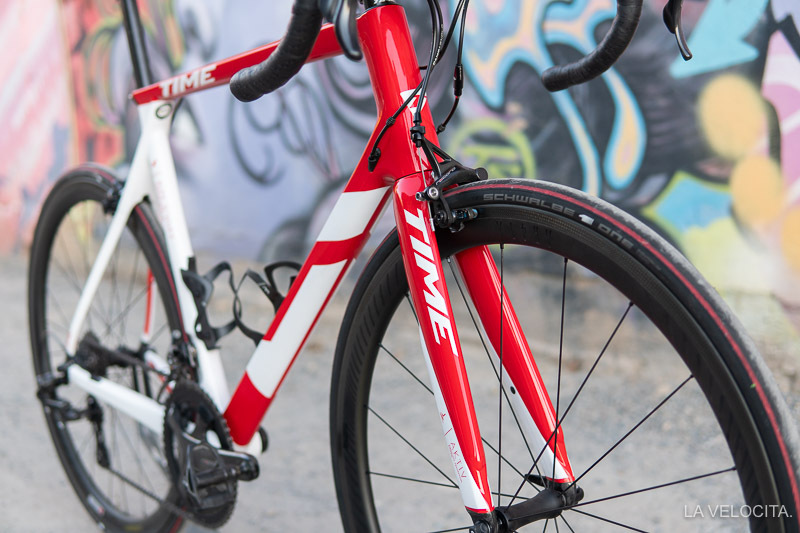 It’s worth noting that TIME covers their frames with, what they call, a lifetime guarantee for the original owner who register their bikes. I haven’t seen the fine print on what that means but it shows a degree of confidence in their product. TIME have given the Alpe d’Huez’s “Racingdrive” geometry which has a comparatively high front end compared to most race bikes. Its 581 mm stack, and tall 186 mm head tube was higher than every other race bike I compared to on www.geometrygeeks.bike. It’s got subtly sloping compact geometry too, with an inline carbon seatpost. The net result is a relatively tall, but quite forward position. The top of the steerer tube is slightly sunk into the head tube, without a typical headset poking out the top adding to the stem height. This means you can drop a stem lower than if there was a standard headset cap and give the bike a more aggressive position. All the other lengths and angles are classic road race bike; parallel 73° head and seat tube angles, 994 mm wheelbase, and 43 mm fork rake. I see those numbers and know a party is about to break out. Riding the Alpe d’Huez was a true pleasure; stiff, smooth, sharp, and speedy. Acceleration is devastating thanks to the burly and widely stanced BB386 bottom bracket. Putting power through the pedals is met with a satisfying burst of speed. It eats up undulating roads, and kicks into a sprint willingly. Bikes that respond like the Alpe d’Huez always lure me into riding harder than usual because of how damn fun it is to sink your boot into them. Every rise and pinch was an excuse to drop the hammer. The Alpe d’Huez is a superb handler too with its riding position is excellent. The decisions to spec an inline post puts more of your weight over the bottom bracket and shifts your upper body further forwards over the handlebars. Threading it down fast and flowing descents is a true pleasure because it tracks so predictably and sharply through corners. I got the Alpe d’Huez to hit all of the lines I usually do on familiar descents with ease, while well within its limits. I gradually got faster and more confident during the test period as I pushed the speed and tightened the lines up. The frame responds to aggressive leans and shifting your body position. It reminded me of the otherworldly Daccordi Noah, although a little less telepathic than that Italian superbike. Its taller riding position makes for a comfortable climber. The flats and the drops are easily within reach and its stiffness makes out of the saddle. I get TIME’s designation of an “Altitude” bike rather than a climbing bike given its mix of excellent handling with a forgiving ride position. The Alpe d’Huez doesn’t exactly meet the weight requirements for a climbing bike anyway, coming in at a 7.7 kg in rolling mode with pedals, cages, and a computer mount. Not heavy, but no weight weeny hearts will be set ablaze. TIME has devoted considerable effort to making the Alpe d’Huez comfortable without compromising the performance. It isn’t trying to be the cliche of laterally stiff and vertically compliant, it’s laterally stiff and vertically stiff. Instead, TIME has been clever with building in damping into the fork and flex in the seat post to make the frame comfortable. Up front the Aktiv front fork on the Alpe d’Huez uses an “integrated mass damper” according to TIME that reduces road vibrations up to 30% by absorbing it inside the fork. Does the Aktiv work? Yes, it’s very good at suppressing vibrations and compromises none of the fork’s stiffness. I noticed a much smoother front end on all roads but it is especially welcome on the harsh chip seal ubiquitous in South Australia. The returns are diminishing with bigger bumps and hits though because elastomers can’t do much against that vertical movement. There’s no moving parts after all. Let’s talk rear end now; and TIME’s carbon post. It’s fantastic. I love flexy carbon posts. I loved it on the CAAD12 I reviewed, I love it on 2 of my own bikes that I upgraded to carbon posts, and I love it on the Alpe d’Huez. The swing and spring in the posts substantially reduces stress on your lower back and acts like a kind of micro-suspension. It reduces bumps when descending too, adding to your confidence and the bike’s stability. Buyers beware that this is a proprietary post shape and I doubt you’ll be able to find alternatives if you want that option. It’s also something you’ll need to treat with care and not over-torque the clamp. The Alpe d’Huez pulls quite a trick in being so comfortable with no compromises to stiffness. It should be rather clear that I very much enjoyed my time with the Alpe d’Huez. I had to dig deep to find criticisms but that’s what I’m here to do. The Aktiv fork is $700 more than the standard fork and that’s a big chunk of cash. I haven’t ridden the bike without Aktiv so I can’t comment directly on its relative efficacy. Personally I’ve found wide, tubeless tyres and lower pressures takes the sting out of a frame in a similar way to the Aktiv fork. My own bonkers Specialized Allez Sprint DSW with its S-Works fork is a pulverizing frame that I’ve made shockingly comfortable with 28 mm tubeless tyres run at 60 psi. I rather liked the Aktiv fork but there’s certainly cheaper ways to make the front end more comfortable. Tyre clearance is an issue for me. The 25 mm Schwalbe One tyres measured at 26 mm on the admittedly wide Reynolds AR41 X wheels and that’s the absolute maximum I’d be comfortable putting in there. Tyres and wheels are gradually getting wider and your future equipment choices could be limited. That’s really the extent of my gripes. The only other thing I could complain about is price but the Alpe d’Huez is within acceptable margins for frames handmade in Europe. $6,999 is quite the chunk of change but there’s plenty of choice at this price. Reviewing bikes this expensive is both easy and difficult. The Alpe d’Huez is an outstandingly good frame, but of course it should be considering its price. We’re beyond “rational” purchasing at this end of the market. If you’re the kind of person who has the means and the will to buy a $6,999 frame then all you need to hear is what makes the Alpe d’Huez special. Put simply; it’s the way they’ve built in comfort with no sacrifice to its exceptional performance. It’s a very fast bike that’s comfortable and sustainable to ride. At time of writing, I’ve clocked over 800 km on the frame and it’s still a pleasure to pull it off the wall for a spin. I’ll be very sad to see it go. Disclosure statement: This bike was sent for review by Bikesportz. It’s not a paid review and we don’t get any benefits from the sale of TIME bikes. What will $700 get you from the Specialized MTB catalogue? It'll get you a rugged little donkey that can take you to amazing places. This is a frame with a very clear sense of purpose: go fast.